In this instance, not of the Cummings variety, we get a seriously lightweight piece from Dominic Lawson, former editor of the Sunday Telegraph and now Sunday Times columnist. Mr Lawson's subject for the day is the so-called "emergency brake", which he chooses to explore in terms of motoring analogies, starting with a little homily, to the effect that, "if the brake feels soft and spongy when pressed, it can be the indicator of imminent - and potentially catastrophic - failure". Apart from the dreary lack or originality, however, the point to take home is that Lawson, in common with the entire corps of journalism – with the one exception of Booker - has not actually explained the nature and origin of what Mr Tusk calls the "safeguard mechanisms". One can only imagine the transformative effect the detail might have, if prominently featured in the British media, pointing out that Mr Cameron was relying on a provision of the EEA Agreement, in force since 1994 and which could have been implemented at any time since. What would also be interesting to see would be the effect this would have on the debate when it was pointed out that Norway, Iceland and Liechtenstein have the power to invoke this provision unilaterally (and that Liechtenstein already has), whereas the UK requires the permission of the European commission. Not least, one might suppose, this would change the dynamic, somewhat, of the argument over loss of influence, as between the UK and Norway, when we leave the EU. Even a micro-state such as Liechtenstein has more "influence" than us, it would appear. The crucial point here, though, is that this detail is readily accessible to the media, and it is not for want of trying that it has not appeared in the legacy media. Following my abrupt and bad-mannered rejection on Wednesday by the House of Commons Environmental Audit Committee, I spent a cordial few hours in a floating hostelry with a member of the fourth estate, taking him through the Tusk "draft decision", including the detail of the "emergency break". Specifically, I took him to the EEA Agreement and showed him Articles 112 and 113, pointing out the similarities in wording, and how it was that these were being used as the legal base for the Tusk decision. Yet, despite some helpful follow-up messages, adding some useful detail, the response has been silence. 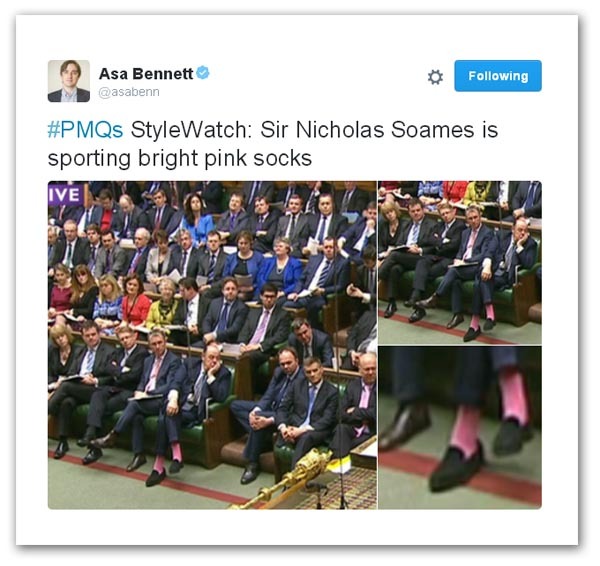 As it stands, this brave hack has given more coverage to the foot attire of Nicholas Soames at PMQs than he has the origins of the "emergency break". And that, in many respects, typifies the legacy media. Even when you go the extra mile to spoon feed then with the detail, handing them the story on a plate, nothing happens. Nothing, it seems, can interfere with the endless torrent of trivia which obsesses modern journalists. Needless, to say, there are those who would have is continue down the path of helping and educating the legacy media, in the hope that they will one day get the message. Experience shows, though, that this is a fruitless exercise. The media don't know because they don't want to know. Their ignorance is self-induced and meticulously cultivated. Dealing with them is wasted effort. Drivel from Dominic is as good as it gets.